Real estate junkies looking for what’s hot in Germany are increasingly eyeing a city in the east that’s become one of the main successes of reunification: Dresden. “Munich is too expensive, Hamburg is too expensive, Berlin is getting too expensive, so investors are looking for the next best thing, and that’s Dresden,” said Ronald Fiedler, head of the Engel & Voelkers real estate agency in the city. Dresden — the capital of the state of Saxony located 200 kilometers (125 miles) south of Berlin — is undergoing a real estate boom that picked up steam as German companies expanded following the global financial crisis. Prices for newly built apartments in the city have gained 47 percent in the past five years, outpacing the national average of 30 percent and Berlin’s 33 percent, according to research firm Bulwiengesa. The city’s success is a chief reason why Germany chose it to host a meeting of Group of Seven finance ministers and central bank chiefs starting next Wednesday. Since reunification, the historic center has been stitched back together around the Church of Our Lady that was rebuilt from a pile of rubble — left from the gutting of the city by Allied bombings at the end of World War II. The rejuvenation has allowed Dresden to regain its prewar moniker “Florence of the Elbe,” a reference to the baroque domes and towers lining a picturesque, winding stretch of the Elbe River. While the city’s apartment prices are rising, at 2,800 euros ($3,123) per square meter they’re still more affordable than in Berlin, where buyers pay 3,850 euros per square meter, and far below Hamburg and Frankfurt’s 4,200 euros. Volkswagen AG builds the Phaeton sedan in a glass factory near the downtown and on the northern outskirts is a sprawling Globalfoundries factory producing communication chips and processors. Dresden’s microelectronics industry includes 1,500 companies employing more than 48,000 people, according to the city’s website. “Dresden, like hardly any other German city, stands for successful rebuilding after two dictatorships and successful structural transformation,” Finance Minister Wolfgang Schaeuble said when he announced the conclave of G-7 nations. The economic growth and an expanding university are fueling the highest investment in offices, shops and hotels in a decade. TLG Immobilien AG, a Berlin-based commercial landlord, says it’s making purchases in the city to take advantage of rising office rents, which have climbed 13 percent in the past five years. “Dresden is developing fabulously as an educational hub, which means it’s attracting a lot of young, smart people, and you notice that in the real estate market,” Niclas Karoff, one of TLG’s co-chiefs, said in an interview. Christian Falkenberg, chief executive officer of property developer and real estate agency Falkenberg & Kakies, is renovating a century-old hospital complex on wooded hills with commanding views of the Elbe that has its own vineyard. Another project is the conversion of a 19th century building, the “Heinrichhoefe,” into apartments in the only surviving baroque part of the city. Apartments, which include an underground parking-lot space, start at 87,000 euros for 27 square meters and go up to 765,844 euros for 170 square meters on the top floor. Still, not all are convinced that now is the time to buy. Those who are bullish counter that around 80 percent of the home buyers come from western Germany — and that even Dutch and Italian buyers are discovering the city. Fiedler predicts a 3 percent annual price rise for real estate in top areas through 2020. Other draws for investors are the low crime rate, expanding population and good governance. 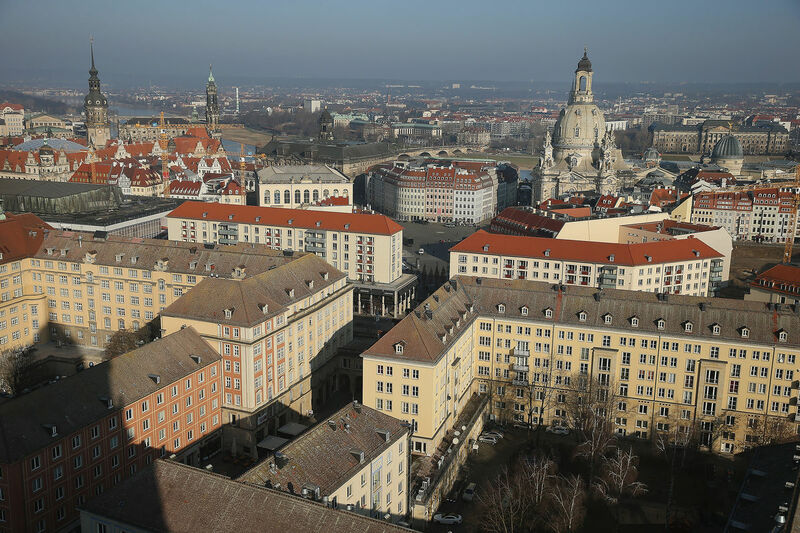 Dresden is one of the few major German cities to be debt-free after using money from selling 48,000 publicly owned apartments to Fortress Investment LLC in 2006 to pay off loans. Last year, the city of 541,000 added another 5,500 people, according to data from the local government. The population is expected to grow by almost 11 percent through 2030, according to a study by Germany’s Bertelsmann Foundation. “It’s the sustainable growth of Dresden’s population that’s the deal-closer for me,” said Hendrik De Booij, chief executive officer of De Booij Immobilien, a Frankfurt-based real estate agency.